Squeeee! I loved this movie! Dulha Dulhan was given to me by Si, my friend and Hindi tutor, among a handful of other Mysterious Movies from Yore in a bag of treasures from her summer in Rajasthan. A good movie is always a treat, but because I'd never heard of this one (and I don't think she had, either), its lovableness feels like an especially wonderful random gift from the universe. Thanks, universe! 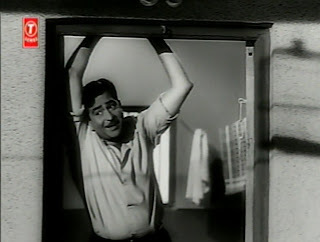 Raj (Raj Kapoor), a radio singer, shares a room in a Bombay chawl with Bansi (Agha), a film studio musician. One day Raj gets a letter from a friend, asking him to go to the train station to meet the daughter of the friend's boss. There he finds Rekha (Sadhana Shivdasani), penniless and with nowhere to stay, and takes her in. Rekha is delightful, and, as her naivete in the big city charms the roommates and the whole neighborhood, she and Raj fall in love. But #1: Raj gets another letter from his friend apologizing for not having written sooner to say that his boss's daughter never made her trip to Bombay. So who's the girl staying in his apartment? Of course, it doesn't matter, and after a few attempts to shake her off, Raj realizes how much he loves her and they get married despite her unknown identity. But #2: While she's out doing some shopping, someone from Rekha's past comes looking for her and takes her back home to Jaipur [ooh, that's a nice concidence for me, since Jaipur is where this DVD began its journey to my house]. Rekha also conked her head and suddenly remembers her actual past - her name is Chanda, and she had been fighting with her family over an unwanted engagement - but forgets her current life in Bombay with Raj. All of this happens while Rekha is out of the apartment, so Raj comes back to an empty room and has no idea why or where she's gone. Nahiiiiiin! Will Raj find Rekha? Will Bansi find Raj? Will Rekha remember her husband and their life together? Will the chummy world of the chawl be reunited? The film is adorable, start to finish. * Raj Kapoor is twinkly and sweet. Raj (the character) makes several attempts to get rid of the mysterious and reputation-risking Rekha before he finally gives into his affection for her, and you see the pain on his (the actor's) face as his love struggles against his sense of propriety and pragmatism. He is heartbreaking as he sings a melancholy version of "Hum Ne Tujhko Pyar Kiya" to Chanda in Jaipur, echoing back to her the words she sang him in Bombay to win him over. 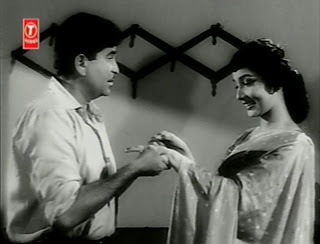 Raj and Agha also have great chemistry, squabbling and making up and vowing their eternal loyalty like an old couple. Sadhana is a wide-eyed, cutey-patooty delight. You might call her simplistic, but she comes off as wholehearted and genuinely charming rather than dumb. The three together form a dear little urban family of sorts. but the neighbors work together to give them a lovely wedding and party, complete with musicians borrowed from Bansi's latest film set. (When I went back to get screen captures, I noticed that their festive, "proper" wedding is hinted at in the film's fun animated title sequence. More on them in a minute.) Later, their landlord tells Chanda's father that Rekha is like his own daughter and welcomes her to stay in Raj's room rent-free. Interestingly there's no contrast to happy, family-filled village life, no moral lesson about how the big city is cold and evil - maybe the point here is that each of us can create family out of the affections we find, no matter who the people we're fond of happen to be. Anandji-Kalyanji's songs are stellar, starting right away with the titles. After he claps his surname into existence, cartoon Raj morphs into the R of his first name, then back again. And don't you love how much he looks like actual Raj? There's no doubt who that is. 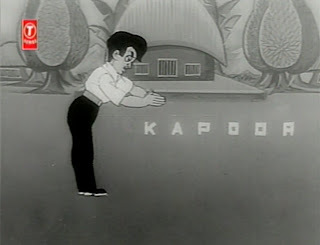 A dancing cartoon Sadhana twirls until her skirts form an S, and she becomes her initial too. Later they dance together, Agha does handsprings, and Anandji and Kalyanji play the drums.We have to wait a bit for the next song, but it's worth it. The whole chawl dances around together in "Mujhe Kehte Hai Kallu Qawwal." "Bane to Ban Jaye Zamana Dushman" reminds me of Paheli's "Phir Raat Kati" puppet dance with its theatrical painted backdrop and stylized choreography. I don't know how either Sadhana or Raj were regarded as dancers, but I thought they were really expressive and completely in keeping with their characters. "Piya Khiche Hue Bandhe Hue Chale Aayenge" [phew!] 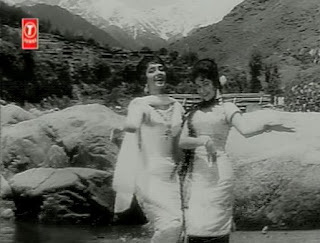 has little to do with the movie and might just be an excuse for Sadhana and her friends to dance around in the mountains, kind of like a superfluous slumber party squeal-fest, Bollywoodishtyle. I loved it. Filmi Geek found me the soundtrack online at Dhingana, a site I've never seen before, and I listened to it all day - though after multiple times through the music in isolation, I've decided I prefer it with its picturizaitons and in the context of the story. You brought me to such a turning point, then shattered my heart.... You did not leave me fit to belong to someone else. What do I say about your unfaithfulness. It makes me ashamed of my faithfulness. That love you had given me.... Who are you turning back and looking at, o heart? Isn't that beautiful? Aaaah! I love how the actor and the words express the confusion, the not understanding, of your beloved just vanishing into thin air...it's not just sadness and grief, it's also the pain of not knowing. Beautiful. I can't imagine there's much new in this movie, but it's absolutely adorable anyway. The tight focus on Rekha/Chanda and Raj helps a lot, I think; both leads do a fantastic job being charming, lovey, confused, and vulnerable. If this story of the leads' off-screen dislike for one another is to be believed, I'm even more impressed at how well the movie succeeds - and at how convincing they are as an on-screen couple. It didn't even suffer the Curse of the Second Half! The balance of elements does tip more towards sadness and drama then, but everything still moves along to the predictable happy ending. Like Pyar Kiye Jaa, the whole thing just comes together perfectly and is totally satisfying. I had intended to keep this writeup really short, just saying "This is really cute! You should see it! ", but it seemed wrong to withhold screen captures and whatever other enticements I could dig up. But it is really cute, and you should definitely see it - and then tell me whether you thought so too. * [There are some more detailed spoilers in this caveat about the movie's adorableness.] Well, almost. There are a few moments of "oh come on, 1964." 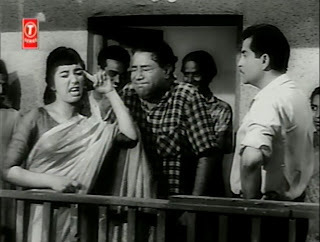 The chawl is scandalized by the idea of Rekha staying overnight with Raj and Bansi, and an ashamed Rekha takes some severe action when she realizes that her presence causes trouble. Later, when Raj finds Rekha in Jaipur, he pleads with her father to believe that they were married, but the only evidence that her father will accept of her marriage to Raj is...well, a physical condition that you don't have to be married to have. And, taking her doctor's diagnosis as proof of her wedding herself, Rekha decides right then and there to return to Raj, even though she doesn't remember him. Insert eye-roll. I can't defend these plot points in any way, but at least they pass quickly, with nobody really freaking out or making a big deal out of things. I was so charmed that I just let them go. 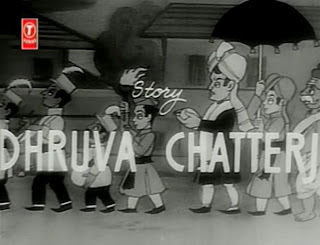 Tried watching this once (because the story was so cute and there was Sadhana) but was so turned off by RK that I couldnt watch past the first 20 min! He looks too old to be her hero! I think he had a great sense of rhythm in his dancing, though. You should check out his interesting gyrations in the songs from Dil Hi To Hai. And Sadhana was a pretty good dancer. Interesting link about Sadhana and RK's mutual dislike. Can imagine him not considering her to be heroine material since he always seemed to go for actresses with more buxom figures. But there might be more to their mutual dislike than that as he apparently had a pretty fragile ego. I'm glad you brought up the age thing - I paused the movie to look up their birthdays, because the difference (17 years) was pretty jarring. I do encourage you to try it again, if just for the songs! Never saw this movie but now I'm tempted. Except for the hymen part. EWWWWWWWWWWWW!!!! I think I have this film, but haven't watched it because...you know...Raj Kapoor is in it. memsaab - I have only seen Raj in one other film, so I don't feel qualified to quantify his Rajiness. But I found him cute. Try the songs on youtube - that might be juuuuuust right. this looks like the cutest movie, do they ever show the two pyaris in the same shot without looking choppy? i think when raj became blobbier his roles became sweeter except Sangam maybe? This looks very cute and lovey, just as you described it! I'm adding it to my ever-growing list! I'm probably not qualified to pass judgement on RK, either, but...I've seen 4 Raj Kapoor directed films, with him starring in 2 of them, and my opinion has went from "wow, what a lovable entertainer" to..."well, he's a bit self-indulgent but he knows how to make a film". It's hard to stay biased about him because it seems to me many of those who have grown up loving his films tend to lean towards the latter opinion. Would you agree? I dont know why people dislike Raj Kapoor so much. I would classify Raj Kapoor's film on time. Most of his older films (black&white) were very good, while his later films (color) were quite .... whatever term you want to use. But even there, I liked movies like Premrogi and Sagar. Mera Naam Joker had many good parts too. His worst movie probably was 'Ram Teri Ganga Maili'. He was melodramatic, but so were most actors of that generation, it is something you have to put up with, just like bad special effects. I'm with Rum and Ajnabi - I'm a shameless RK apologist, as you know. Therefore this is DEF going on the list. Rum: a blobby Raj = a kind Raj? LOL! Rum - It is it is! :) I don't my DVD has the best possible transfer from film - some of it is quite hard to make out. I'm intrigued by the blobby Raj factor...we need to gather more evidence! Nida - Yay! As for Raj, I have the same numbers as you, interestingly. You sum up what I have heard about him, but my own experience is that in 1964 he's (still?) very entertaining. 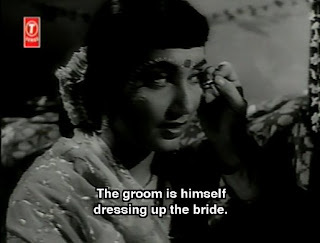 He was more endearing to me here than in the earlier movie I saw (Barsaat, 1949). ajnabi - Do it! You and millions of others! Vatsala - Oh goody! Do keep me posted with what you think. I was wondering about how the Raj breakdown went re: b&w/color too! And am totally amused at your "...whatever term you want to use." The generation point is interesting. I remember the most recent time I saw High Noon and thought WHY IS THIS GOOD?!?!? because Gary Cooper is like a plank of wood. Different eras, different styles, I guess. PPCC - Watch it! You must. Re: Rum's idea: perhaps Raj is Santa? i am writing a post on the varying blobby roles raj has so it might shed some roshni! well i never heard abt thsi movie. but ther are so amny great movies during this time. the 50's and 60's. and movie industry was dominated by guru dutt,raj kapoor, bimal roy. guru dutt was the best of that time. even his movie (pyasa"was included in the TIME magazine's 100 greatyest movioes ever. he died at the age of 39 tahnks to drug overdose. but at that time he was already a brilliant movie maker. do u know when one of his movie "kagaz ke phool"( paper flowers got bombned at the box office he left directing movies. but continue producing and acting in movies. i think kagaz ke phool was his best.well when i saw pyasa i did not think anything else for some days.his other good movies are arr parr(tranparent),chuadhi ka chand(moon in the 14th day). 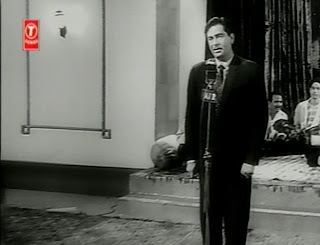 tapan - I have a lot to learn about 50s and 60s Hindi films! Thank you for the recommendations. This is an utterly charming, cute movie. 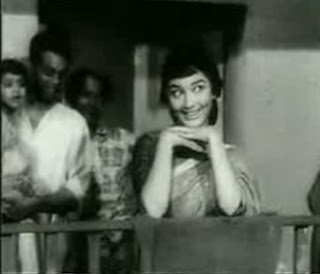 Sadhana, Agha and even RK are wonderful in it... especially in the first half. I didn't see much of Raj's 'chaplinesque' here except in his gait sometimes, which had probably become a habit by then and not a deliberate thing. Himmat - Isn't it? So cute! I should watch it again!